Barberry is an erect, deciduous shrub, from three to eight feet high, with leaves of an obovate-oval form, terminated by soft bristles, about two inches long, and one-third as wide. The flowers are small and yellow, in clusters, and the fruit bright-red oblong berries, in branches, and very acid. Berberis vulgaris var. acutifolia (Prantl) C.K.Schneid. Berberis vulgaris var. alba DC. Berberis vulgaris var. apyrena Schrad. Berberis vulgaris var. asperma Willd. Berberis vulgaris subsp. cantabrica Rivas Mart. & al. Berberis vulgaris var. flava Schrad. Berberis vulgaris var. iberica Steven & Fisch. ex DC. 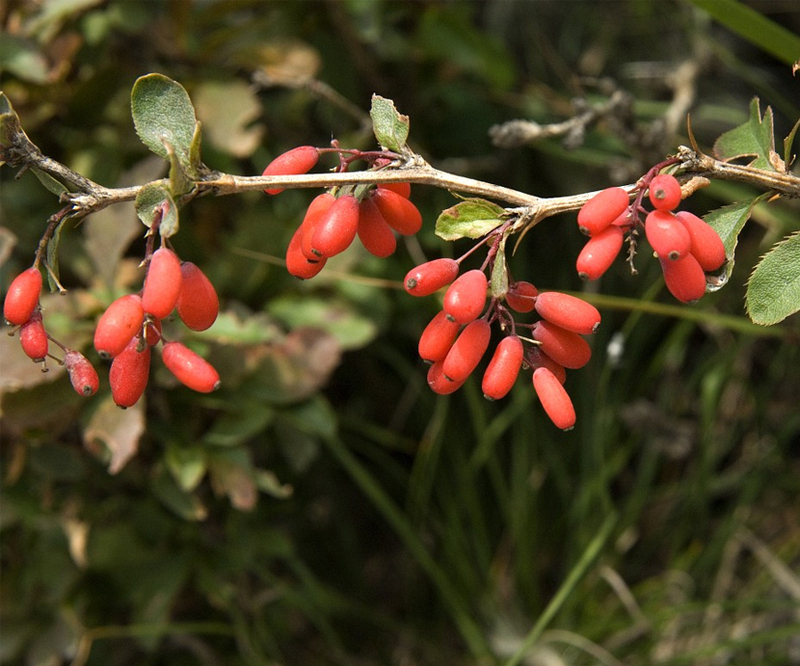 Berberis vulgaris var. lutea DC. Berberis vulgaris var. nigra DC. Berberis vulgaris var. orientalis (C.K.Schneid.) Grossh. Berberis vulgaris subsp. orientalis (C.K.Schneid.) Takht. Berberis vulgaris var. purpurea DC. Berberis vulgaris var. rubra Willd. Berberis vulgaris var. sanguinea Schrad. Berberis vulgaris var. serotina Schrad. Berberis vulgaris var. violacea Willd.